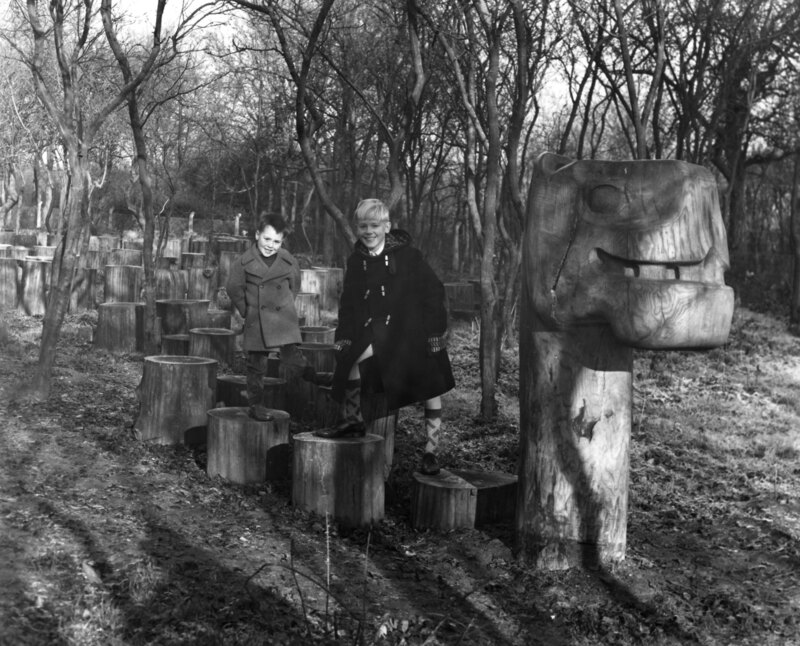 The Monster of Bandley Hill was one of many wood sculptures carved by Mark Harvey, which were erected round the town to provide play for children. Many have rotted in time, and have not been replaced. This one, pictured in 1963, was sited in a cul-de-sac off Chertsey Rise. I remember the ‘monster’ but I’m not sure that it was still in tact when you were growing up. I used to live next door to you at No. 21 with my Mum (Grace), my Dad (Peter) and my sister (Carol). Sadly all three have now passed away. I will look through our photos as I am sure I have some of you when you were a child. Remember it well. Me and my brother played on it in the early seventies. It was known as the dragon to me and the kids we played with. I used to live at No.23 Chertsey Rise (up until 1987 when aged 14). But I don’t remember the Monster of Bandley Hill. It must have gone before my time. I do remember the Donkey Park though, and the “Black Alley” at the back of Bandley Hill Junior School. Does any one have any pictues of the Donkey Park or Bandley Hill from the mid-80’s? When I get time I will open a page of the (sadly) few photos I have of these from my childhood in the mid-80’s. I lived in Chertsey Rise from 1957 until my marriage in 1962 and my memory could well be not as sharp these days. That said, I believe this area was originally called Bandley Hill Bottom and the “Monster” was also known by many as the Bandley Hill Dragon. This park was a favourite cut through for courting couples from Bandley Rise to Chertsey Rise…. preferable to using Kymswell Road, with houses both sides and a few twitchy curtains. It was in fact on a summer evening stroll amongst the trees that I proposed to my wife of nearly 50 years. We always had a laugh about how romantic Bandley Hill Bottom sounded. great to see the “bandley monster”..hearing about the donkey and adventure playground..i used to use the adventure playground reguarly..memories of jacket potatoes cooked in our dens!.HSE would be shocked..! I had forgotten my Brother and I posed for this photograph. Antony Hills at the front, Andrew Hills behind. Well here’s a surprise – my older brother Antony Hills and me on the serpents back!